Winter arrives early in Maine with numerous outdoor places for amateur ice hockey, day or night. As kids growing up in Derby, Maine back in the 1950’s, we were usually ice skating by Thanksgiving, and often with no snow on the ground. December was different, and usually required a crew shoveling snow to clear the ice each time it snowed. 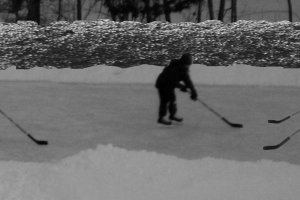 Derby Pond was a favorite for hockey because it was man-made and perhaps 40 feet wide and 2-300 feet long. The puck was easy to retrieve compared to lake hockey where a bad shot could travel for a quarter mile. Lakes were fun in other ways like opening your jacket on a windy day, and then spreading your “wings” for effortless sailing in one direction. Another ice skating option was a nearby swampy bog with easy access across the road and through the woods apiece about 1000 feet from our home. A large open space was the central spot for a bonfire made from old tires donated by one of the gas stations uptown in Milo. The bog had several adjacent paths through the alders that were perfect for a game of tag on ice. The paths were more like an obstacle course, so the chase involved as much skill as speed, especially at night. I first learned to skate on figure skates, so I never could get the knack of hockey skates. I wanted those teeth on the front for quick stops. The thrill of flying across the ice at top speed is memorable, and then spinning 180 degrees on one toe, and continuing backwards for 20 feet watching the spray of ice off that one skate. It seems like yesterday, but that spectacle on ice was over 40 years ago. Anyway, our sessions of ice hockey on Derby Pond would go on for hours, sometimes into the night, and it was truly amateur. No one owned hockey equipment other than skates, pucks, and hockey sticks. I don’t think the market for hockey helmets, gloves, or shin guards for kids got discovered until years later. The only goalie defense for a slap shot flying straight at you about a foot above the knees and headed for your tender spot was a quick dive left or right. Let ’em score! Getting 4 or 5 boys per team was typical, and each kid usually brought a spare hockey stick because the first one rarely survived the marathon sessions. Misfired hockey pucks off into a snowbank were not always found, so if we ran out a chunk of ice did just fine as a substitute puck. Thinking back, it’s amazing how we just kept going despite the cold or occasional bloody nose. That were fun. Ayuh.